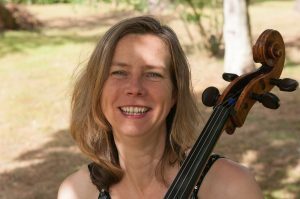 Rebecca Gilliver is Principal cellist of the London Symphony Orchestra and plays in the European Camarata. Early success in national and international competitions led to critically acclaimed debut recitals at the Wigmore Hall in London and Carnegie Hall, New York. Rebecca has performed in major music festivals such as Bath, Bergen, and the Manchester International Cello Festival. A keen chamber musician, she has collaborated with international artists including Nikolai Znaider, Sarah Chang and Roger Vignoles with whom she recorded for BBC Radio 3. She is a regular participant at IMS Prussia Cove. She has appeared as a soloist with the Halle and the Academy of St Martin in the Fields and is also featured on a CD of Enescu chamber music for the Naxos label. Originally joining the LSO as Co-principal in 2001, Rebecca was promoted to Principal in 2009. She has played guest principal with orchestras all around the world, including the Australian Chamber Orchestra, New Sinfonietta Amsterdam and most recently the World Orchestra for Peace. She is Professor of Cello at the Guildhall School of Music.